Chimichurri is a green sauce typically made from finely chopped fresh parsley, garlic, sunflower oil, and vinegar. It originates from Argentina and makes a fantastic marinade for meat like this prime rib steak recipe below. This article and Zesty Prime Rib Steak recipe was contributed by April Jones as a resource for helping you find the best kitchen blenders for your kitchen. April loves to share with others about the benefits of healthy eating while making it fun and lasting. Healthy living begins in the kitchen! The other day, I was thinking about the most ‘indispensable’ kitchen appliances and gadgets I have in my kitchen. No – I was not just randomly thinking about it, I was looking for my lemon-squeezer. As I waded through the tangled junk I have in a messy kitchen drawer, it struck me that the lemon-squeezer was a must-have item. You are right – I can always use my hands to squeeze the juice but using the gadget is cooler and, it doesn’t hurt on cuts and it’s cheap to purchase. So what are my two kitchen favorites or must have and can’t do without – Cast-iron skillet and a Blender. From stove top to the oven, my food comes out perfectly nearly every time. I love to brown and sautin cast iron, and then pop whatever I’m whipping up into the oven for final ‘polishing.’ I’m never disappointed! It takes less than a couple of minutes to blend a fantastic chimichurri or roasted red pepper sauce for a tasty bit of beef (that you seared and roasted in your cast iron skillet!). I do not know about you, but I always need to have a good mayonnaise on hand, and I make my own in my blender a couple of times a week. It is simple to make and once you get the hang of it, you will never have to worry about getting mayonnaise on your hands when trying to scrape out the last bits from the bottom of the jar! Below is a recipe to show you what I mean – arm yourself with your cast iron skillet in one hand and your blender in the other! Chimichurri is a green sauce typically made from finely chopped fresh parsley, garlic,sunflower oil and vinegar. It originates from Argentina and makes a fantastic marinade for meat like this prime rib steak recipe below. Season the prime rib steak with salt and pepper on both sides, and rub into the meat. Heat your cast-iron skillet on the stovetop until it is very hot. Add a little bit of olive oil to the skillet (it will smoke! ), and gently place the prepared prime rib in the hot skillet; sear for 5 minutes. Turn the prime rib over and place in the skillet with the prime rib in the oven approximately 7 minutes or until the internal temperature registers 120 to 130 degrees F. on your instant-read meat thermometer. Medium Rare - 125 degrees F.
Medium - 130 degrees F.
Remove from oven and remove the prime rib steak from the skillet and let it rest for 5 minutes. 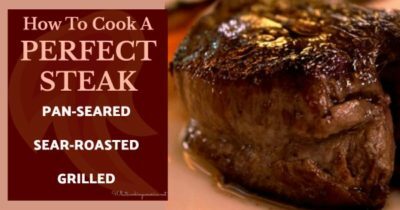 Learn How To Cook the Perfect Steak. To serve, slice the prime into thick slices, plate, and drizzle with the Chimichurri Sauce. In your blender, add the parsley, scallions, garlic, wine vinegar, and red pepper flakes (if using). Blend for several seconds. With the blender on, slowly pour in the olive oil until you reach the consistency you like (it should be slightly emulsified or thickened). I usually make chicken salad out of one of the breast pieces – it makes just enough and I love to ‘much’ on it while I’m writing. From this recipe you can add different types of greens, different vegetables, more fruit or less and so on. Blend up a big batch and take with you to work or keep in a container in the fridge to drink on through out the day. Learn how to make delicious mayonnaise in your blender. Juicing For Health – Can green smoothies stop junk food cravings? Drinking whole raw foods blended in to a nice smooth drink can help overcome addictive cravings for coffee and donuts. Drinking a green smoothie is taking the first step to replacing a bad eating habit with a better one. Is it better to juice or blend? There is always a lot of discussion among my friends about whether they should juice fresh produce or blend whole foods. I’m always looking for ways to prepare something that is a regular, every day, old-fashioned ingredient, and pork chops filled the bill. I figure the meal that I’m going to tell you about, cost no more than $2.50 per plate. Where are you going to beat a deal like that? This recipe takes no more than 30 minutes to prepare, and I guarantee that your family will be hanging around the kitchen wondering when dinner will be ready.